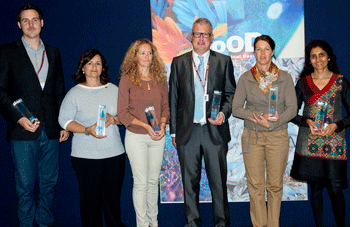 Blue Drop Award at MoOD Brussels - Albatros International. Producer of highly decorative and quality jaquard woven interior fabrics. The Dutch company Albatros received the Blue Drop for Upholstery. Niek De Prest praised the high level of craftsmanship of the designs. Inge Vervest of Albatros was clearly very proud of the Blue Drop. receivean award for our hard work!"